I’ve said many times on this blog that there aren’t enough grapefruit candies out in the world. 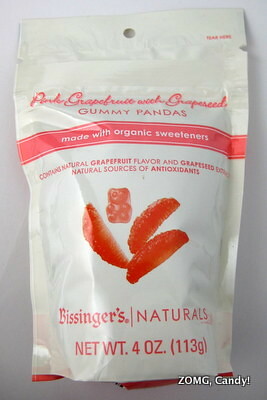 There are, at least, Bissinger’s Gummy Pandas that come in pink grapefruit (with grapeseed), which I bought at Whole Foods. The bag makes all kinds of health claims: “made with organic sweeteners”, “natural sources of antioxidants” (from the grapeseed extract), and “great tasting and good for you”. Whole Foods in a nutshell, I’d say. I’m always dubious about health claims made by highly processed foods. Do people really want their candy health-washed? Organic sugar is still sugar; it can still give you cavities and diabetes. These were gummy pandas rather than gummi bears, but the panda part wasn’t so obvious. They had bigger eyespots, which just made them look surprised or myopic to me. 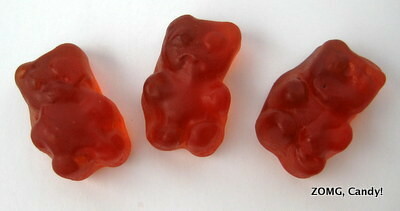 The deep pink pandas had a firm, bouncy chew, which is my favorite kind of gummy texture. They started off sweet with the underlying tanginess of a nicely ripe grapefruit. Further chewing intensified the sweetness and added a mellow tartness. I missed grapefruit’s bitter edge of pithiness that Albanese’s version has, but these were still great in their own right. 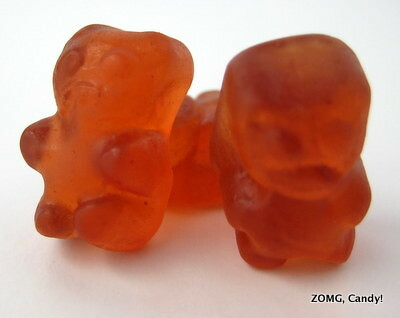 I give them an OM, with the caveat that they are expensive gummies. Whole Foods premium!